Accessories: Accompanied by A. Lange & Söhne fitted box, guarantee, Certificate indicating the watch is a limited edition of 30 pieces, leather holder and product literature. In just 25 years the Lange 1 has become one of the most iconic designs of modern watchmaking, its offset dial and large date display having become signature elements. 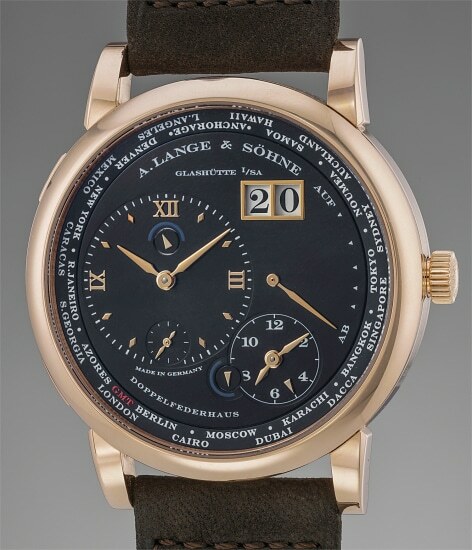 However, Lange & Söhne is also respected for its technical expertise and "no compromise" philosophy. This is the reason why the present Zeitzone (time zone in German) is more than just a dual time watch. The main dial on the left indicates local time whereas the subdial at 4 o’clock is dedicated to a second time zone. The small arrow in the second time zone dial points at the city that time is currently set on. This solution allows for an outstanding aesthetic impact of the piece, which acquires somewhat of a “world time” vibe, and it is enormously practical. When analyzing the Zeitzone, it is actually apparent how Lange placed practicality above all else, and how the aesthetics of the piece are a consequence of this choice: form truly follows function, rather than the other way around, both under a visual point of view and also under an operational one. Visually, beyond the already mentioned city ring, the watch features day/night indications for both local and second time zone, avoiding the very common issue of confusing night and day times at the home location. Operationally, the piece features a quick-setting pusher at 10 o’clock for the date and a second pusher at 8 o’clock that advances the city ring and second time zone indicator. This pink gold case and black dial combination was specially made for Singaporean retailer Sincere in a limited edition of 30 pieces. In excellent condition and complete with box and papers the present Lange 1 Zeitzone is an example of Saxon watchmaking at its best.